I loved my Grampa Bradley……even though he didn’t really know me. He was diagnosed with Alzheimer’s Disease when he was 52 years old. He never got to know me. He only knew that I was little baby girl that came to visit him at the nursing home with a lady and little boy (my Mom and my brother, Casey). He didn’t know them. He didn’t even know my Mom, his daughter that he had raised. He didn’t know that Casey was his grandson who was born one week after he moved from his house of over 30 years to the nursing home. Grampa didn’t remember that he had been an Engineer for Harrison Radiator for 30 years, a mechanic for the Town of Newfane or that he once owned his own business, DL Bradley and Son. When I met him, he sat in a chair all day, crying and saying “what’s on the agenda”, he wore diapers just like me, and sometimes he had to be fed, just like me. I never got to know the “real” Grampa Bradley. And he never got to know me……..
A few years after Grampa died, Gramma Bradley was diagnosed with Alzheimer’s Disease. I did get to know the “real” Gramma though. 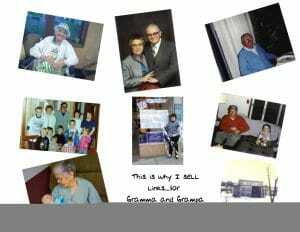 She was the Gramma who read books, golfed, drove a car, sewed clothes, made me dolls and who’s house we used to visit. She used to have “Kit Kats and Smarties” for all of her Grandchildren. Soon Gramma forget to turn the stove off, got lost when driving, forgot to take her medicine and forgot who her 4 children were and her 7 grandchildren were. She too, had to move to a nursing home. Eventually, she only spoke “gibberish”, wore diapers, wouldn’t eat, got really skinny and sometimes hit the nurses. My Mom and siblings bought her a doll, named it Andrew and gave it to Gramma. She used to cuddle, sing and talk to the doll like she used to do to me. Gramma died at age 89, 14 years after being diagnosed with Alzheimer’s. …Remember those who Forget to Remember….